‘Parliament’, said Senator George Fairbairn, ‘should exercise supreme control over the public purse’. With his regard for the principles of the Constitution, his keen business acumen and eye for detail, Fairbairn exemplified the Senate’s developing role as a house of review. Born at Newtown, Geelong, Victoria, on 23 March 1855, the eldest of six sons and a daughter, his father, also George Fairbairn, was a pioneer pastoralist and colonial politician, who had migrated from Scotland about 1839. His mother, Virginia Charlotte, née Armytage, was the daughter of pastoralist, George Armytage, of Bagdad, Van Diemen’s Land. Fairbairn was educated at Geelong Church of England Grammar School where, like his brothers, he was known for his sporting ability. For two years, he attended Jesus College, Cambridge. He returned to Australia in 1876, and for seven years managed two central Queensland pastoral properties owned by his father (Peak Downs and Barcaldine Stations). In the early 1880s, Fairbairn returned to Victoria, working for, and later becoming managing director of, the Union Mortgage and Agency Company of Australia. For periods of up to forty years, he served on the management and advisory boards of various companies. Managing the family property at Lara, Victoria, he was chairman of the Fairbairn Pastoral Company and a foundation member and president of the Victorian Employers’ Federation (VEF). Later, he was reported as saying that he owed his political career to the VEF. At a by-election in October 1903, Fairbairn entered the Victorian Legislative Assembly as the member for Toorak for the Ministerialists, serving in 1905 on the select committee on ‘Tied Houses’. He resigned from the State Parliament in September 1906 to contest, successfully, the federal seat of Fawkner as an Independent Protectionist, aligning himself with the anti-socialist ‘Corner’ group. In 1909, he joined Deakin’s newly formed Liberal Party. Elected as a Liberal in the 1910 election, Fairbairn lost his seat in 1913, the Argus attributing his defeat to a redistribution. On 5 May 1917, Fairbairn was elected to the Senate on the Nationalist Party ticket, achieving the highest number of votes in his state. His first speech raised themes to which he would often return, especially his interest in the detail and advisability of public expenditure. He advocated as a cost-saving measure the amalgamation of state and Commonwealth electoral and taxation departments, and drew attention to the ‘unduly high’ levels of taxation. Noting that the Hughes Government had been elected on a promise of ‘no conscription’, he envisaged another election if AIF divisions in Europe could not be kept up to full strength on a voluntary basis. He returned to this subject in 1918, urging delegates at a conference convened by the Governor-General to support voluntary recruitment. Fairbairn pursued the Government over what he considered ill-conceived policy and he was critical of bills that sought to grant coercive powers. He recommended, for example, that provisions allowing the taking of thumb prints be omitted from the Aliens Registration Bill. (He was chairman of the Aliens Committee, a non-parliamentary body.) Fairbairn was concerned with the Parliament’s scrutiny of the executive government, especially the Senate’s role in examining legislation sent from the House of Representatives. Referring to W.M. Hughes, who had at one time worked under his management on a pastoral property, he said: ‘As the Prime Minister has put it, “A Democracy is not a good machine for a war”, so he had to become an autocrat, which was rather a congenial occupation for him . . . We are proud of the way in which he carried things . . . but now we want to get back to our old parliamentary system. We want to scrutinize the Estimates . . .’. Not afraid of exercising an independent, non-partisan view, Fairbairn criticised expenditure on public buildings and bemoaned the steady expansion of the public sector. Regular targets were Australia House in London, Canberra (the site of ‘wasteful expenditure’) and the marbled General Post Office in Melbourne (fit for the ‘Doge of Venice’). He was instrumental in bringing about the Government’s withdrawal of a statutory rule to establish a federal health department on the grounds that Parliament had been insufficiently informed. He opposed the creation of the proposed Tariff Board, and criticised the appointment of a diplomatic representative to the United States. The Nationalist Government did not always welcome his probings. In 1920, during debate on the Westralian Farmers’ Agreement Bill, he questioned the viability of grain bulk handling facilities, arguing that a committee should further examine the proposal. With no established process for referring bills to committees, Fairbairn was unsuccessful, though his view was vindicated. The bulk-handling scheme proved unworkable. On other occasions his arguments succeeded. In debate on the War-time Profits Tax Assessment Bill in 1917, he was instrumental in ensuring that bona fidecooperative societies were exempted from tax on the grounds that cooperatives had been intended to operate as non-profit organisations. Influenced by his experience with employers’ organisations, especially during the 1890s shearers’ strike and sceptical of arbitration and wage boards, Fairbairn supported conciliation as a means of dispute resolution, commending the establishment of shop floor committees to harmonise industrial relations. He thought the right to strike should only be exercised following a secret ballot supervised by the Government and with the consent of the registrar of the relevant industrial court. In 1920, he secured an amendment to theCommonwealth Conciliation and ArbitrationAct to enable employers to enter into individual contracts with workers in certain circumstances. He argued that workers should not be treated merely as cogs ‘in a great machine’ and advocated shorter hours as a quid pro quo for gains in efficiency. In 1919, he encouraged Labor senators to appoint a delegate to the International Labor Conference in Washington. He espoused the cause of workers who refrained from striking during the war and whom he suggested had been unfairly dealt with by the Government. Despite his stance against centralisation of power in Canberra, in 1919 he contended that industrial relations powers should be vested entirely in the Commonwealth. Fairbairn did not stand for re-election in 1922. Agent-General for Victoria in London (1924–27), he became a KB in 1926. President of the Victorian National Union, in 1930 he advocated the replacement of federal and state Parliaments with administrative councils, boldly suggesting ‘the abandonment of Canberra’. Fairbairn died at his home at Como Avenue, South Yarra, on 23 October 1943 and was buried at Melbourne General Cemetery after a funeral service at St John’s Church of England, Toorak. He had been married in the same church on 24 November 1880 to Jessie Kate Prell who had died in 1921. The couple had five children of whom only one, Clive, survived his parents. There were no children of Fairbairn’s second marriage to Lorna Bessie, née Robertson, which took place on 20 February 1924 at the Mornington Presbyterian Church. Described by shearers in 1890 as ‘just and fair’, Fairbairn was part of a distinguished Australian political family. 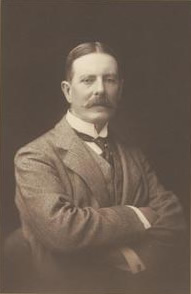 His grandson, Sir David Fairbairn, was a member of the House of Representatives and a minister, as was his nephew, James Fairbairn, killed in an aircraft crash outside Canberra in 1940. Fairbairn’s interests had extended beyond politics. He was involved in the Big Brother movement, co-founded the Henley-on-Yarra regatta, was a board member of the Alfred Hospital, president of the Melbourne Club, and warden at St John’s, Toorak, where he attended regularly. CPD, 28 June 1921, p. 9351;Michael D. de B. Collins Persse, ‘Fairbairn, Sir George’, ADB, vol. 8; Donald S. Garden, ‘Fairbairn, George’, ADB, vol. 4; Steve Fairbairn, Fairbairn of Jesus, Bodley Head, London, 1931, pp. 6–7; Alexander Henderson (comp. and ed. ), Early Pioneer Families of Victoria and Riverina, McCarron, Bird & Co., Melbourne, 1936, pp. 43–49; Corian(Geelong), ‘Geelong Grammar School Portraits’, March 1977, pp. 194–195; Punch (Melbourne), 18 January 1912, p. 76; Argus (Melbourne), 25 October 1943, p. 5, 27 October 1943, p. 7; Pastoral Review and Graziers’ Record (Melbourne), 16 November 1943, pp. 733–734. Union Trustee Company of Australia, Jubilee Souvenir, [The Company], Melbourne, 1935, pp. 14, 15, 17; Australian Mutual Provident Society, Seventy-five Years of Progress . . . 1849–1923, W.E. Smith, Sydney, 1924, p. 7; Shirley Thomas, Challenge: The First 100 Years of the VEF, Victorian Employers’ Federation, Hawthorn, Vic., 1985, pp. 46–47, 59–60, 90; Australasian Pastoralists’ Review (Melbourne), 15 August 1891, p. 195; Pastoralists’ Review (Melbourne), 15 December 1905, pp. 777–778. Age (Melbourne), 28 May 1909, p. 5; Punch (Melbourne), 18 January 1912, p. 76; Argus (Melbourne), 3 July 1926, p. 35. CPD, 12 July 1917, pp. 104–109; CPP, Report on the voluntarysystem for the Australian Imperial Force, 1918; Gerhard Fischer, Enemy Aliens, UQP, St Lucia, Qld, 1989, pp. 284–285; CPD, 6 May 1920, pp. 1835, 1840, 12 March 1920, p. 357, 20 July 1921, p. 10280, 21 November 1918, pp. 8172–8173, 24 August 1917, pp. 1420–1421, 28 June 1921, pp. 9351–9352, 20 July 1921, pp. 10277–10279, 30 July 1919, p. 11028, 28 July 1920, p. 2994. CPD, 24 September 1920, pp. 4951–4953; John Sandford, Walter Harper and the Farmers, Westralian Farmers Co-operative, Perth, 1955, pp. 130–133; CPD, 14 September 1917, pp. 2088–2089, 2097, 2102. CPD, 12 July 1917, pp. 107–108, 12 March 1920, p. 360, 16 September 1920, pp. 4625–4629 (the clause became s. 58B of the Conciliation and Arbitration Act 1904 (Cwth)), 23 January 1918, pp. 3366–3368, 23 October 1919, pp. 13825–13826, 1 October 1919, pp. 12813–12814. Argus (Melbourne), 3 July 1926, p. 35; Cameron Hazlehurst (ed. ), Australian Conservatism, ANU Press, Canberra, 1979, pp. 72, 73, 98, 103; Herald (Melbourne), 8 November 1930, p. 1; Ann M. Mitchell, The Hospital South of the Yarra, Alfred Hospital, Melbourne, 1977, pp. 178, 217; Argus (Melbourne), 25 October 1943, p. 5; Henderson, Early Pioneer Families, pp. 43–9; Fairbairn file, ADB, ANU. This biography was first published in The Biographical Dictionary of the Australian Senate, vol. 1, 1901-1929, Melbourne University Press, Carlton South, Vic., 2000, pp. 320-322.